Brooklyns and Howards to Explore Ideas of Kid Elberfeld Next Saturday. Kid Elberfeld, the peppery little shortstop of the New York Americans, has some novel ideas of making the game of baseball intensely interesting. His latest suggestion for gingering up the national game is the most sensational yet, The "Kid" says, the first batsman in each inning should have the privilege of either running to first or third base, In other words, the batsman should be permitted to run around the bases in the order now observed, or, if he wished, just reverse the order, going to third first, then second, then first. and home. Elberfeld says such a game would be productive of great excitement, in that it would keep every player on the jump, trying to figure out beforehand just what way the batsman would run, The privilege of selecting the order in which the bases are to be run, is restricted to the first batsman in each inning, All the other batsmen in that inning would have to follow the order of running the bases set by the leader. 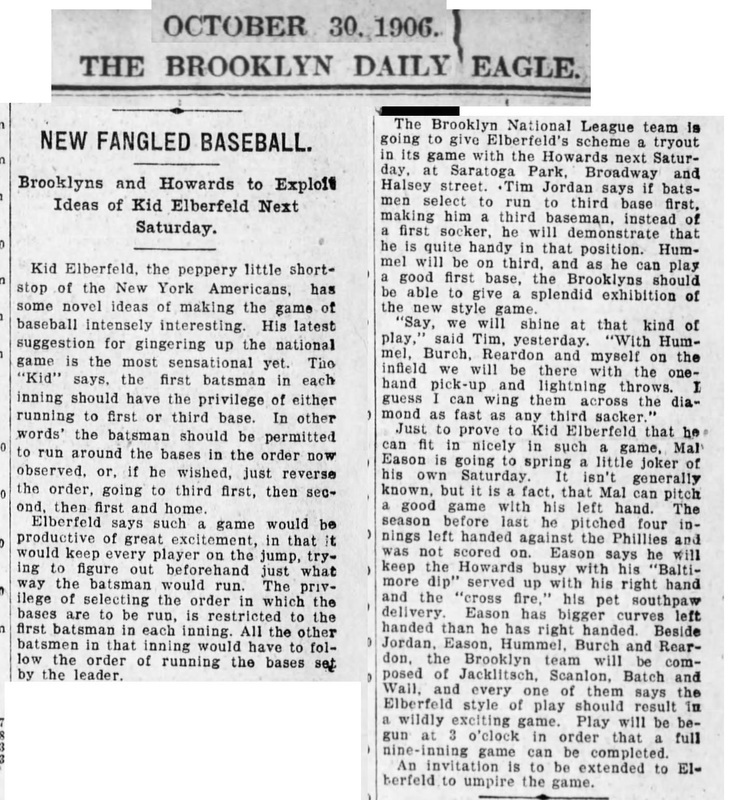 The Brooklyn National League team Is going to give Elberfeld's scheme a tryout in its game with the Howards next Saturday, at Saratoga Park, Broadway and Halsey street. 'Tim Jordan says if batsmen select to run to third base first, making him a third baseman, instead of a first socker, he will demonstrate that he is quite handy in that position. Hummel will be on third, and as he can play a good first base, the Brooklyns should be able to give a splendid exhibition of the new style game. "Say, we will shine at that kind of play," said Tim, yesterday. "With Hummel, Burch, Reardon and myself on the infield we will be there with the one-hand pick-up and lightning throws. I guess I can wing them across the diamond as fast as any third sacker,"
An invitation is to be extended to Elberfeld to umpire the game.